From Wahl Professional’s commercial grade line of products, the ’19 Hot Lather Machine is intended for professional use only and is designed to deliver the sharp performance that experts demand. The Wahl ’19 Hot Lather Machine warms but doesn’t overheat, is easy to refill, and is ready to be used daily. It heats completely in 50 minutes and lets you know when it’s ready with a blue indicator light. It features a removable internal liquid pump and bottle for hassle-free maintenance that requires simple cleaning with soap and water. For your convenience, the ’19 Hot Lather Machine (#68908) comes with an internal liquid pump and bottle, an additional bonus liquid pump, a 12 oz. bottle of pre-mixed Wahl Liquid Lather, and operating instructions. The Wahl Professional ’19 Hot Lather Machine measures 9 inches high and weighs 1 lb. 6 oz., including removable liquid bottle and pump. To use, simply remove bottle from machine, unscrew the pump, fill to (but not past) the fill line, and allow to heat. Leo J. Wahl invented the first hand-held electric clipper back in 1919. He believed in necessary, reasonably priced products that enhanced the lives of everyone who used them. Today, all Wahl products embrace the principles of our founder. We offer reliable, value-priced devices and solutions that protect skin and hair while performing on all skin and hair types. PROFESSIONAL PRECISION: From Wahl Professional’s commercial grade line of products, the ’19 Hot Lather Machine is intended for professional use only and is designed to deliver the sharp performance that experts demand. RELIABLE AND FUNCTIONAL: The Wahl ’19 Hot Lather Machine warms but doesn’t overheat, is easy to refill, and is ready to be used daily. It heats completely in 50 minutes and lets you know when it’s ready with a blue indicator light. It features a removable internal liquid pump and bottle for hassle-free maintenance that requires simple cleaning with soap and water. 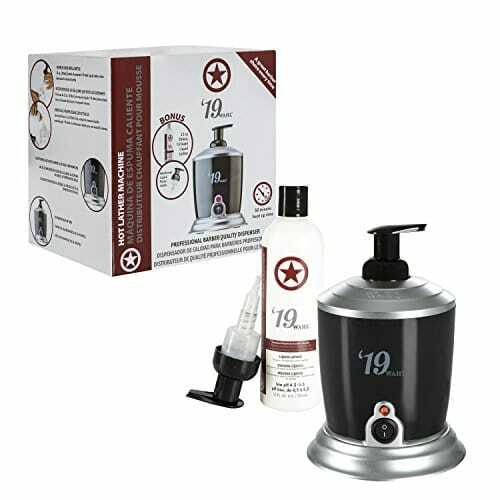 ACCESSORIES INCLUDED: For your convenience, the ’19 Hot Lather Machine (#68908) comes with an internal liquid pump and bottle, an additional bonus liquid pump, a 12 oz. bottle of pre-mixed Wahl Liquid Lather, and operating instructions. PRODUCT SPECIFICATIONS: The Wahl Professional ’19 Hot Lather Machine measures 9 inches high and weighs 1 lb. 6 oz., including removable liquid bottle and pump. To use, simply remove bottle from machine, unscrew the pump, fill to (but not past) the fill line, and allow to heat. For sale in the USA only. PLEASE NOTE: Wahl Professional Products purchased from this authorized dealer feature a manufacturer’s warranty, which is not available from unauthorized dealers.